Righto, we are relocating to a separate pitch for all of the day's big action. Come and join the fun here. Birmingham boss Gary Rowett: "We've worked very, very hard this week in terms of preparing the players for something that little bit different. We respect anyone we play. I've played in lower league teams who have beaten bigger teams. But our mentality is key today. We trained on a very, very poor pitch we've got at the top of our training ground to prepare them for today. "We know if we play well and use our athleticism and quality then we should win the game. But we also know that if we don't perform we could lose. That's what the cup is all about. Today is a brilliant occasion - we all love the FA Cup. Here's hoping it's a great day for both teams." We asked you to vote on who should be named as the next Newcastle manager, now Alan Pardew has rejoined Crystal Palace. And it was former Swansea man Michael Laudrup who topped the running, just ahead of Tim Sherwood. Thanks as ever for your votes. Former Blyth striker Alan Shoulder on the club's 1978 cup run: "The biggest memory I have of the cup run was the third round here, when I managed to score the winner. It was a fantastic time and hopefully the lads can do the same. That goal was the first time I'd ever been on TV, and I managed to get the winner so job's a good'un! "I think the the Blyth spirit which we had in the years gone by was on display again Hartlepool in the last round. Birmingham are a polished outfit but if the fans get behind them, as they did with us in '78, then they have a great chance." Gateshead manager Gary Mills: "We'll come here today and give a good account of ourselves. We will play good football and I've got some good players who are comfortable on the ball. It's the way I was brought up in football, to play the ball on the deck. We're hoping we've got a little bit that can hurt West Brom. We're used to seeing a lot of the ball in the Conference; today we'll have to adapt to playing well without it. It's exciting, today - it's what I'm in the game for. "I stayed in the same hotel last night as Tony Pulis, so that was interesting! I leaned from the master, Brian Clough, how to relax my players, and I've done that. Cloughie would always tell us to relax. He didn't rule by fear; he took the fear out of us. I have not spoken to the players about West Brom - we know nothing about West Brom but we know everything about ourselves." There are 17 Cup ties this afternoon, and we will have all the biggest team news with you shortly after 14:00 GMT. Get all of the news, reports, goals, clips and highlights throughout the weekend on our FA Cup page. Former England Test cricketer Graeme Swann: "My dad's from 200 yards down the road. I'm a big Newcastle supporter but they don't try to win cups anymore! So I'm here today, hoping for a win and that Blyth can join Newcastle in the fourth round. "The romance of the FA Cup is the whole point, the whole story. Any team that goes on a run, the whole country gets behind them. My dream is that Blyth face Newcastle in the next round." Oli Collins: On the way to Brentford to see Brighton in the FA Cup! Tom Wade, Blyth manager, on 5 live Sport: "I attended ever game of our last cup run, in 1978. I was 19 at the time - great memories. Those lads are legends in Blyth, and hopefully we can add to that today. "A lot of friends and their kids are coming down today - we're a very family-orientated club. There will be a few thousand here today and we probably know every one of them. "The town has gone through a bit of a bad time in recent years, so we need a good press. We're getting that now. "We've got a secret against Birmingham today, but I'm not going to tell you. It'll be tough, we'll give it at all and even if we lose it won't be for want of trying." Helen Wilkinson tweets a cracking picture of Wolves fan Andy Cooper in what can only be described as the ultimate Christmas jumper. "I think the Conference is of a similar standard to League Two or even One. There are a lot of games today where they may be leagues apart but there's not a big difference between the teams. So there are quite a few upset possibilities on the cards." The weather in the midlands is in contrast to that at Blyth, where the sun is out and illuminating Croft Park, which is crawling with the media this afternoon. We mentioned a little earlier that there was a pitch inspection at Cambridge United ahead of their FA Cup clash with Luton and it is good news, the game is ON. "Too many teams undermine the FA Cup, especially the higher up the league you go. But if you have a good cup run then the battle for places in the team intensifies. It can be huge for an individual player's season." Stuart Laws: Blyth Spartans lucky socks are on! They've got a 100% record, so it's in the bag today. Southport chairman Charlie Clapham on 5 live Sport: "There are 25 coaches of fans who have left Southport today. We've sold out our very generous allocation of 2,700 tickets. The magic of the FA Cup is that you can cause an upset. "And why can't we dream? We go to Derby with a lot of hope in our hearts." The finest Ronnie Radford drawing we've ever seen. What a man, what an FA Cup moment. But have you read when Ronnie met our very own Ben Dirs? Radford is such a gent that he even gave Dirsy a lift to Huddersfield train station - 30-odd miles out of his way. You don't get that from footballers these days. Read the meeting of minds here. Ross James: Ronnie Radford 05/02/1972. "I think Gateshead will get at least a draw against West Brom. Gateshead are a good footballing side and have nothing to lose, so they could cause an upset today." Blyth Spartans' Stephen Turnbull, who scored in his side's second-round win against Hartlepool, talking to Dan Walker: "Birmingham's results of late have turned their season around big time. Their boys will be flying high and confident, so it'll be a very tough game for us. "Today, my mam and me sister are coming to this game and my dad will be at West Brom cheering on my brother, who plays for Gateshead." Rory Nolan: Served Rio Ferdinand at a shop I worked at - we discussed the rowing that was on 5 live in-store. Edem Blewuada: Spoke with Wayne Routledge about strict teachers at Queen's Golden Jubilee at my primary school . he used to be a pupil there. Terry McCann: Met David James once buying a painting. Sadly he didn't drop it, making it a better story... though I note the bloke who owned the shop couldn't wait for him to pay and leave while it was still intact! FA Cup third-round weekend refreshes the parts other competitions can't reach. "Everyone has a Football League performance in them." "When you're a lower division team you hope your players play well. Everyone has a Football League performance in them - there may only be four or five a season, which is why they're not professionals. "But if they deliver and the bigger team underperforms, that's where your shock result comes from." This moment must feel a long time ago to Wigan fans. The 2013 FA Cup winners followed their success with relegation and now under the management of Malky Mackay, sit 23rd in the Championship. today's trip to Bolton as he starts a three-game ban. Stat: Wigan are unbeaten in their last 13 FA Cup matches (W10 D3) excluding penalty shoot outs. "My cupset prediction? The pitch has never been the greatest at Tranmere and Swansea like to get the ball down and play. I think Swansea will rest a few for this game and that could give Tranmere an opportunity." Stat: The Swans have gone eight FA Cup matches without a clean sheet. Cambridge United have called a pitch inspection for 13:15 GMT ahead of today's FA Cup tie versus Luton at the Abbey. It has been pouring down for the last couple of hours. Promotion-chasing Middlesbrough could make changes to their side when they meet Barnsley at Oakwell. Aitor Karanka's side are fourth in the Championship ahead of their meeting with the League One outfit. "I have to transmit to the players that they have to play with the same motivation as them and play with our usual intensity and style," says Karanka. "We know we are better than them, but we have to play in the same way as we do in the league." Stat: Boro have won none of their last four FA Cup matches away from home. BBC Radio 5 live has eight hours of FA Cup action to shout about this afternoon. John Motson's top 10 FA Cup third round shocks until 13:00.
full match commentary of Blyth Spartans v Birmingham City with updates from all the other games. Darren Fletcher and Robbie Savage take over with 606 and the chance for you to have your say on the day's big stories. "What a tie for AFC Wimbledon. All the pressure is on Liverpool. And the first half hour is so important. If Wimbledon get in their faces and stop them playing then the game is anyone's. There's a real cup upset on the cards there." "Adebayo Akinfenwa is called The Beast, and right so. If you want to fight him there's only one winner. But he's not the most mobile, so you have to get in front of him and anticipate the ball. For an hour, Wimbledon have to hustle and really try and upset Liverpool." With managerless Newcastle in action against Leicester today, we want to know who you think is the best candidate to replace Alan Pardew at St James' Park? "I don't think Steven Gerrard had any other option. I think he's been forced out. He's never come to an agreement with the club and this doesn't look right. This should have been sorted out months ago. It's a shame the Premier League is going to lose him because he's still such a talent. "How are Liverpool going to replace Gerrard? He's going to be a massive loss unless they've got somebody lined up to replace him. And who out there is as good as Steven Gerrard?" "Steven Gerrard's influence on the pitch is massive but his influence on the dressing room is even bigger. Youngsters will look to Gerrard for a hand. I do think he's been forced out. He's been offered a contract but sometimes an offer is just thrown at you, knowing you're not going to take it. I do think he's been forced out. "It's obvious he's not going top stay in England because he doesn't want to play against Liverpool. But the MLS is an unforgiving league and there will be a lot asked of him there. But he will certainly never play for another Premier League team." Stuart Tebbutt: Met Samuel Eto'o at a petrol station, he was looking confused and nearly put diesel in his Aston Martin. Showed him the right one. Charlie Pilkington: Spoke with Tony Adams about Cirencester Cricket Club and the pavilion redevelopment project we're undertaking. Alice May: I know that Alex Oxlade-Chamberlain's favourite chocolate is Magic Stars. What do you do if you top the Championship, the riches of the Premier League are growing closer, yet you have an FA Cup tie? Go for it or as has become fashionable rest your players? Bournemouth, who top England's second tier, face Rotherham and after doing reaching the quarter-final in this season's League Cup, manager Eddie Howe has no intention of easing up. "We would love a run in the FA Cup," says Howe. "The one we had in the League Cup did us no harm at all. In fact, if anything, it started the really good run of form we have been able to maintain." Stat: Rotherham have won just one of their last 23 FA Cup matches against teams from the top two tiers of English football. Blyth Spartans manager Tom Wade talking to Dan Walker: "It's a massive day for the club. The Third Round is always very special. For Blyth, this is a money-spinner, but for the players and management it's a chance for us to pit our wits against professionals and find out if we're as good as we think we are. "We're buzzing, and of course we do have a bit of a chance." "I'm from Gateshead, so I don't know Blyth that well. When I was learning to drive my instructor got me three tests in three weeks in Blyth... and I failed every single one!" So Blyth's tie with Birmingham wins the vote for most likely upset. As many as 120 places in the football pyramid separate the sides. Elsewhere today there is an 86-place gap between West Brom and Gateshead and an 89-place divide between Derby and Southport. We've been asking which of today's games offers the most likely opportunity for an upset, and 36% of you think seventh-tier Blyth could be the unfancied team celebrating this evening. Thanks for voting. Dan Walker and guests Chris Waddle and Danny Higginbotham are at Blyth Spartans ahead of the seventh-tier side's game against Birmingham City this afternoon. On BBC Radio 5 live now, there's a chance to listen again to John Motson's top 10 FA Cup third round upsets. You voted for your favourite on the BBC Sport website yesterday. download the podcast to listen at your leisure. Preston North End - two-time FA Cup winners - welcome Norwich City to Deepdale this afternoon and boss Simon Grayson has admitted his priorities are elsewhere ahead of the fixture. "The priority is the league game at Sheffield United and the JPT tie with Walsall but we go into every game with the intention of winning it," says Grayson. Stat: Preston played the first FA Cup final to be broadcast on television when they beat Huddersfield Town 1-0 in 1938. Colin Williamson: Once met George Best at Heathrow. Told him my mum was his sister's French teacher and he signed my plane sickness bag. Robbie Derbs: I chatted to Daniel Agger about tattoos near the exit of Anfield. Conference side Gateshead have trained at Aston Villa's Bodymoor Heath training ground ahead of their trip to face West Brom at the Hawthorns. This is Gateshead's first appearance in the third round for 60 years and boss Gary Mills says: "As a Premier League side, we shouldn't get near West Brom - but I feel we can." Their side includes 36-year-old John Oster, the former Everton and Sunderland player, and the South Africa international Matty Pattison, once of Newcastle and Norwich. Player-assistant manager Darren Caskey, 40, started his career at Tottenham. Stat: West Brom have lost their last three FA Cup matches at the Hawthorns. video page of the BBC Sport website from 17:15 GMT. impromptu Blyth Spartans news conference is well worth a watch. If they play as good a game as they talk, Birmingham could be in for some trouble this afternoon. Stat: Birmingham have lost just one of their last 15 FA Cup matches against lower league opposition (W11 D3 L1). It is 16 years since Southport last appeared in the FA Cup third round and the Merseyside part-timers are clearly determined to make the most of the occasion. The Conference club's final training session ahead of today's tie at Championship high-flyers Derby County took place at St George's Park, the FA's national football centre. helping out with the family run micro-brewery after being released by Shrewsbury Town this time last year. Could there be an upset brewing? Stat: Derby have failed to score in three of their last four FA Cup matches. Bradford could field some fresh faces when they travel to 2004 finalists Millwall this afternoon. "We have a couple of bumps and knocks in the squad going into the game on top of this, so it means we have had to put the second years (scholars) in our plans for the weekend," said Bradford boss Phil Parkinson. "There is no youth football over the Christmas period so we normally allow most of them time with their families. "Given the injuries we have in the camp at the moment, however, we have had to bring all the second years back in early to help us prepare for the game." Stat: Bradford have lost nine of their last 13 FA Cup matches away from home. tweets: @BlackpoolFC 1953 FA Cup winner's medal #genuine #FACupAdventure #getcarriedaway come on you pool! Keep tweeting us about your FA Cup excitement on #getcarriedaway. confirms he will move to the US at the end of the season but does not reveal which team he will join. The Liverpool captain, who announced he will leave the club on Friday, was widely expected to move to Major League Soccer after stating he will find it too difficult to face the Reds. against Blackburn on Boxing Day. tweeted the above picture: There you go, a man of my word. But will Paddy's spit and polish pay off when 36-year-old Heskey - an FA Cup winner with Liverpool in 2001 - faces his former club Wigan later in a third round derby? A few of your texts about non-football conversations you've had with famous footballers. Simon in Newcastle: I had a conversation with Nikos Dabizas in the late 90s about his family's role in the production of cheese in Greece. John in Leighton Buzzard: I once had a detailed conversation, in a Southampton nightclub, with Le Tissier, Beresford and Hirst, about the affect wags have on your finances! Ronnie Radford with a rocket for Hereford against Newcastle 43 years ago. It really does warm you up for what this competition could throw up this year. How he scores that goal on such a surface is anyone's guess. Tune in to BBC Two now for more classic FA Cup moments - or use the Play symbol at the top of this page. The FA Cup tends to throw up plenty of heart-warming human interest stories and this weekend is no different. One sees twin brothers Stephen and Phil Turnbull both playing for separate non-league clubs in the third round. Gateshead midfielder Phil says he is sick of Blyth's Stephen talking about Alan Shearer's praise for his winning goal against Hartlepool in the FA Cup second round last month. "It's very relaxed with the gaffer here," says Phil ahead of the trip to West Bromwich Albion. "We eat together on the night and then it is each to your own until breakfast at 9am before we meet for a walk at 11am. I'm relaxed and think all the lads are. It's a no-lose situation for us." Stephen and his Blyth team mates take on Birmingham City. On BBC Two and via the live coverage tab at the top of this page, you can watch Guy Mowbray present an FA Cup re-run of some of the tournament's classic games. Hereford v Newcastle is first up and the pitch has 22 players on it and around three blades of grass. A punch-up early doors gets a yellow card. That would be a 10-game ban these days. We are loving your interaction on #getcarriedaway. You are genuinely building our excitement. Keep sending us your FA Cup moments. BBC Radio 5 live sports extra also has commentary of four FA Cup third round ties this weekend. Full details below. full list of all 17 matches taking place today, check out our fixtures page but some of the stand-out ties include Leicester v Newcastle, Blyth Spartans v Birmingham, Derby v Southport, Fulham v Wolves and Tranmere v Swansea. we had to pull out of the FA Cup or play a youth team in it. I never forget all the lads stood up and said 'we can't pull out of the FA Cup'. "I remember Andy Cole saying 'we have got to play a youth team, we can't not play in the FA Cup'. And that's what all the players wanted." Possibly my favourite live text entry ever. On Twitter: As football fine-lists go, Blyth's takes some beating. Spending a penny costs £2. You can hear more from Dan on Football Focus at 12:10 GMT on BBC One. new Crystal Palace manager Alan Pardew is sat in the opposition dugout or not. "Different managers have different tactics but we just get on with it. We're on a good run - unbeaten in 16 games. Bring it on," he says. "It is the biggest game in Kent for 30-odd years, I don't think a Conference side has hosted a top-flight club in that time. It is massive for Dover and Kent as a whole." given his first interview since being appointed manager of the club he once played for this morning. Palace sit 18th in the Premier League and Pardew expects to spend in January to boost their chances of survival. "Without putting pressure on the chairman I think we are going to need a player or two at least and that's what we are going to try and do," the 53-year-old tells the club's website. Ishaan: Parents bought a dining table off Angel Rangel in the Championship days. Had a chat about how to take from his flat. We also tried to haggle the price down but the guy drove a hard bargain. Eating on that table is the best. Mark Carolan: Asked Gareth Bale how his Spanish was coming along. "Not very well." he replied in English. @pablo_zabaleta about his fish and chips he had on Fridays. Coming up from 11:00 on BBC Two, Guy Mowbray presents FA Cup Rewind with highlights of classic FA Cup third-round ties from yesteryear. Ties to relive include Hereford's famous upset of Newcastle United in 1972 and Shrewsbury beating Everton at Gay Meadow in 2003.
confirm they have reached an agreement to sign Hatem Ben Arfa. Reports circulated on Friday that Newcastle had terminated the Frenchman's contract and subject to a medical, he will now return to his homeland with the Ligue 1 side. Phil Neville was on BBC Radio 5 live earlier talking about the experience of taking on a plucky lower-league underdog in the FA Cup. [in 2012]. The team that you've watched on the video isn't the team that you're playing on the pitch - they raise their game. "But I used to love it because it was like a throwback with the muddy pitches and the fans right on top of you. I used to relish it." The back pages are filled with Steven Gerrard but one paper, The Independent, go with a nostalgic lead. "Mouthwatering ties offer 'smaller' clubs chance to create their own shocks," reads their back page. his top 10 shocks in a feature on our website. Tranmere manager Micky Adams on his struggling League Two side hosting Premier League team Swansea at Prenton Park: "Any football club at the lower end of the Football League would relish a match against a top-flight side and we're no different. "To get to the third round we've had to win two games - and when I took over we were bottom of the Football League - so we needed any type of win. Any win breeds confidence, hopefully we won't get too distracted and take confidence from the game into our league form." Suzanne McGuigan: Taking my shoddy tinfoil FA Cup to see Gateshead at The Hawthorns. Bring on the Baggies! Dan Walker and the Football Focus team have loaded up and taken the show on the road this FA Cup weekend to Blyth ahead of their third-round tie against Birmingham City this afternoon. from 12:10 on BBC One. Lawro faces former Wimbledon goalkeeper Dave Beasant and ex-Liverpool striker John Aldridge in his weekly guess of the weekend's scores. All three predict a Derby win and none of them think Southport will even score. Where is today's most likely upset? Which of today's ties is most likely to produce an FA Cup upset? Have your say by voting at the top of this page. Southport forward Richard Brodie is hopeful the Conference strugglers can cause a shock at Championship high-flyers Derby County. famously almost nicked a draw for Crawley at Manchester United when he headed against the Old Trafford crossbar in 2011. "It's been hard not to talk about the Derby game because everyone around the town is talking about it. All the old cliches come out in the FA Cup, but it is 11 v 11 and there will be a shock somewhere. We just hope it is us." Danny Baker Show on BBC Radio 5 live has been asking if you've had any non-football conversations with famous footballers. As round three gets into full flow today, one side are still celebrating reaching this stage even though they thought they had done so just under a month ago. beat MK Dons 1-0 on Friday having already beaten Karl Robinson's side on 6 December. Their initial encounter was voided as the Spireites had fielded an ineligible player. Baggies bound to lose Berahino? West Brom are one of the four Premier League sides in action today, but the back page of today's Sun will have made gloomy reading for Baggies fans. The paper is reporting that star striker Saido Berahino could be set to depart the Hawthorns this month, with Spurs and Liverpool leading the race for his signature. Berahino, 21, has bagged nine goals this season, seven more than any other West Brom player, but new boss Tony Pulis has reportedly sanctioned his sale for £20m to fund a transfer spree to secure Premier League survival. The Baggies take on Conference side Gateshead. Danny Baker Show on BBC Radio 5 live is asking which non-football conversations you've had with top footballers. Daniel Addy: Recently spoke to Southampton's Pelle about the perfect cup of tea. Surreal. Niall McGuinness: Dennis Irwin scolded me for not having a drink with my dinner - I was drinking green tea. Good fun. He was nice. Jacob South Klein: I had a lovely conversation with Pavel Pogrebnyak last week about the weather. And Steven Gerrard is the topic of conversation at Liverpool's news conference which is taking place right now. The Liverpool captain announced on Friday he will leave the club after 26 years this summer. "There will be a time for him to come back here for sure but this is time for him to have another opportunity," Liverpool manager Brendan Rodgers tells reporters. "Steven knew my feelings on wanting him to be here. He has been a brilliant captain for me. I wanted him to stay here." Liverpool take on AFC Wimbledon in the third round of the FA Cup on Monday. If you need some Gerrard FA Cup adrenaline this morning, you can see his stunning contribution to the 2006 final on our website. Liverpool line up Gerrard loan return? That Steven Gerrard, eh? Here today, gone tomorrow, back next January. Well, that's what Saturday's Daily Telegraph would have you believe - the paper reports that Liverpool are lining up a short-term return for their departing captain in early 2016. "No sooner had Gerrard announced his intention to leave Anfield at the end of this season, than his club were exploring the possibility of a swift reunion in a year's time," writes North West football correspondent Chris Bascombe, noting the precedent set by Arsenal's move for Thierry Henry. Cardiff win but who was watching? The Welsh side into round four mentioned below is Cardiff City. The winners of the competition in 1927 eased to a 3-1 win over Colchester on Friday. The draw for round four takes place on Monday, live on on BBC One and online after AFC Wimbledon's meeting with Liverpool. Cardiff City Stadium for the Bluebirds' win. So we have 34 teams in action today in 17 matches. 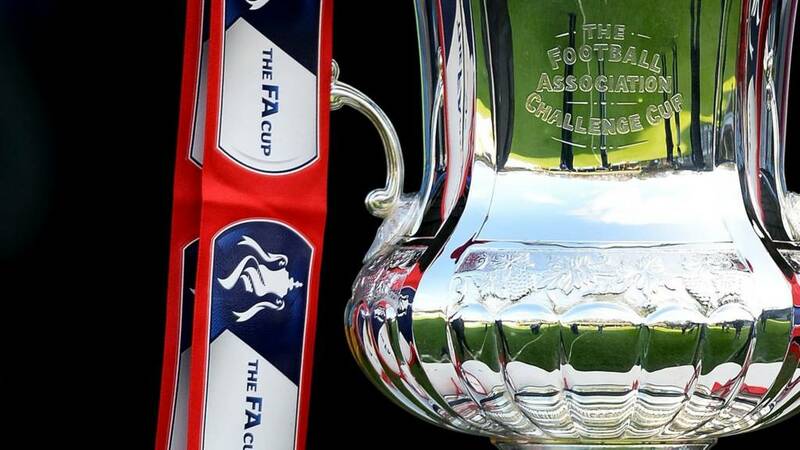 The third round stage of the FA Cup includes 64 teams. You have to play six ties to win the tournament from this stage. check out our feature which also explains the odd of drawing home ties all the way to Wembley. What non-football conversations you've had with top footballers? Danny Baker Show on BBC Radio 5 live and Danny and the team will have former Liverpool and Ireland defender Phil Babb in the studio among their guests. He'll be asking what actual nightmares footballers have rather than the cliched commentary ones when they have a bad performance. Plus, Danny wants to hear from you about what non-football conversations you've had with top footballers? #bbcfootball or you can text on 81111. Comedian Josh Widdecombe will also be in playing the sausage sandwich game. When I think football, Saturday, the FA Cup and tradition I think half-time pie. It doesn't get much more traditional than today's fixture list. No early kick-off, no late kick-off and 17 matches starting at that age-old time which football used to run by - 3pm or 15:00 GMT for those of you on military time. Four Premier League sides play as West Brom take on Conference side Gateshead and Leicester face off with Newcastle. FA Cup page of our website. John Motson's top 10 FA Cup shocks are all featured for you. And somewhat rudely interrupting our FA Cup flow at this early junction are Crystal Palace. They confirm Alan Pardew as their new manager on a three-and-a-half year deal. "Everyone knows my history here, what's important now is to move the club to the next level," says the 53-year-old former Palace player. Pardew will be in charge when Palace travel to Dover Athletic on Sunday. I once watched a documentary about Leyton Orient which heavily featured their somewhat off-the-wall manager John Sitton. Here was a man prone to the most volatile of dressing room outbursts, but I recall one poignant piece of advice he gave his players on an FA Cup day. "Somewhere at ten to five this afternoon, someone will be making headlines they don't want." We have 17 matches in all. Opportunities aplenty for an upset. Where will cup embarrassment strike? "It's a great feeling to win it, a great feeling. "It's a dream day for me. To score two goals, celebrate with these fans and lift the FA Cup, a dream day." This week's headline maker Steven Gerrard speaking after success over West Ham United at the Millennium Stadium in 2006. This trophy creates moments which get replayed forever and gathers pace today as the third round - the stage where teams from England's top two divisions enter - gets going. Strap yourself in for a special day of football. You will not miss a kick here on our live text or on BBC Radio 5 live. Welcome, enjoy and pray your team reach round four.